With yet another Surf Air semi-commercial service to Truckee starting May 23, many Truckee – Tahoe region residents will experience more frequent plane noise and diminishment of their enjoyment of clean environment and quality of life without the vast majority of them needing or being able to afford such luxury private air travel — “executive travel in an executive aircraft,” as described by Justin Hart, Vice President, Member Acquisitions for Surf Air. 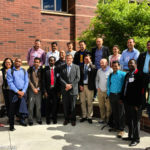 “You get to bypass the chaos of commercial airlines and hassles of long security checkpoints,” Mr. Hart told local business leaders at a recent meeting in Truckee. “We save our members three to four hours every time they fly,” Mr. Hart added. Surf Air has had regularly scheduled semi-commercial daily flights to Truckee from other California destinations for about a year. The private membership airline will be starting new luxury service to Truckee on May 23 from Burbank, and from Oakland on September 8, 2015, according to an announcement posted on its website. 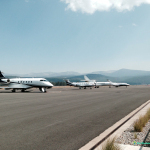 Read more about Surf Air destinations, including Truckee. But there is an extra price to pay for such luxury travel that does not come from the pockets of the airline owners or affluent passengers, especially if an airport they are using is located almost in the center of town with loud planes flying low over homes of people who came here to seek a better quality of life in a quiet and pristine environment. Jets and other planes also fly over lakes and hiking trails. 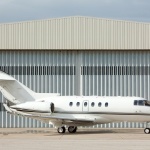 The average Surf Air member makes between $200,000 and $400,000 per year, according to Mr. Hart. The vast majority of Truckee residents don’t make that kind of money. They can’t afford to use the Truckee airport for air travel, but they are paying nevertheless for such travel by those who are much more better off than they are. The irony is that that local, mostly middle class, residents give the Truckee Tahoe Airport District approximately $4.3 million in annual property tax subsidy with an understanding that large part of it will be used to mitigate the environmental impact. (Most may not even be aware that such a subsidy exists.) The Truckee Tahoe Airport District is sometimes using this public tax money to acquire open space near the airport and on other noise mitigation measures, but the Airport is also spending taxpayers’ dollars on such things as solicited donations to the local Chamber of Commerce and for building of a swimming pool in Truckee. The swimming pool is a worthwhile project in itself, but it is not related to aviation, other than the part of the donation used to reinforce the building against plane crashes. It’s important to keep in mind that these donations from the Truckee Airport are not private contributions by airport users but come from property tax money paid by local residents. It’s public money being redirected to other uses. Truckee is one of the most dangerous general aviation airports in the United States because of high altitude, mountainous terrain and weather. At least the swimming pool donation leaves Airport Board supporters of jet travel for the rich less money for constructing taxpayer-subsidized jet hangars, although it appears that they are set on building them no matter what. More jet hangars will facilitate an increase in private jet traffic, noise and pollution in the Truckee Tahoe area. This well-documented and predicted trend, not widely communicated to local residents, will also inevitably lead to lower home values in at least some parts of Truckee, in addition to any other damage to the economy and the environment. The aviation forecast is for the number of plane operations in Truckee (take offs and landings) to increase from the current number of about 25,000 per year to 33,000 annually in a few years. A large portion of these operations will be by private jets and turboprops. 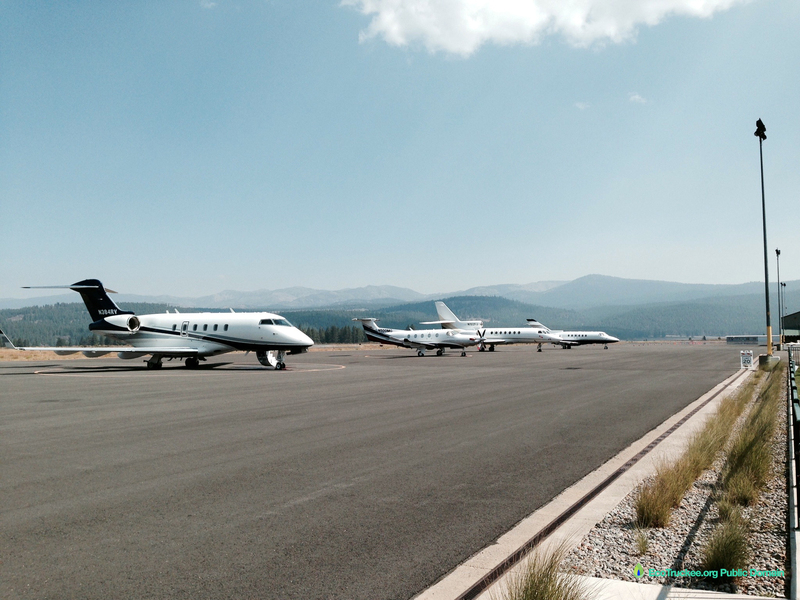 Jets have already surpassed the 15 percent threshold in Truckee, which triggered the 2004 Airport Board resolution on taking measures to discourage jet traffic, but Airport officials have not developed a plan to deal with increasing jet use of the local airport. Airport Board President John Jones who strongly supports building of jet hangars using the local taxpayer subsidy asked that the 2004 Jet Noise resolution be either scrapped or modified, calling it “outdated.” Surf Air uses the Pilatus PC-12, a single-engine turboprop passenger aircraft, which is quite noisy, but other operators, including Jet Suite, increasingly offer air travel to Truckee on private jets which most people find even more disturbing as they fly overhead. 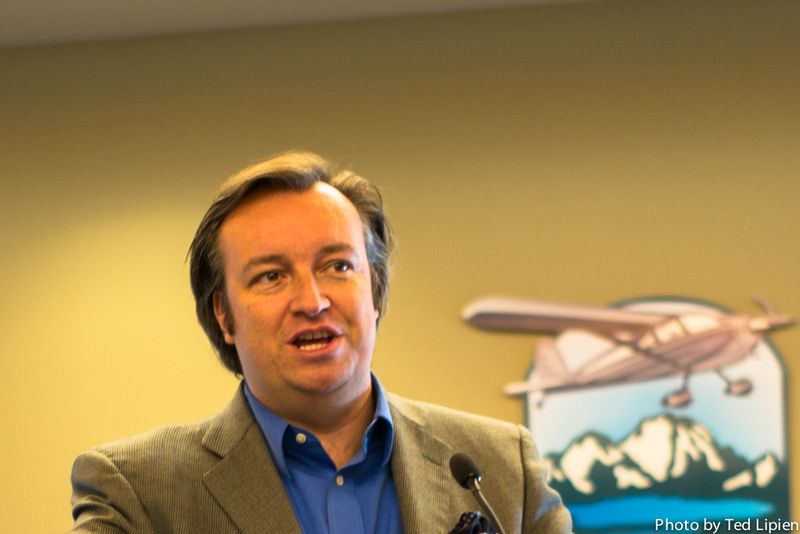 Justin Hart, Vice President, Member Acquisitions for Surf Air, was applauded at the Truckee Donner Chamber of Commerce Good Morning Truckee event held at the Truckee Tahoe Airport on May 12, 2015. 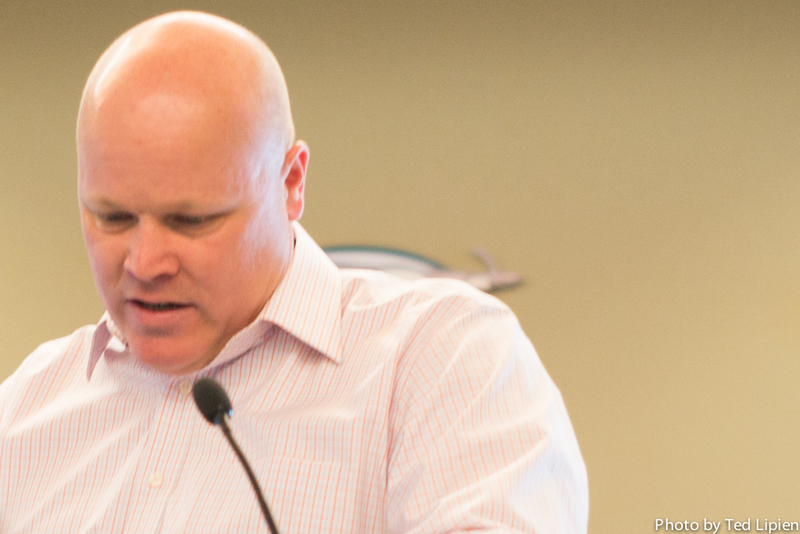 Kevin Smith, Truckee Tahoe Airport General Manager is also Truckee Donner Chamber of Commerce Board Chairman, which highlights close ties between the airport management and the local business community. Many local businesses like the prospect of profits that more semi-commercial air travel to Truckee may bring. It is up to local residents and environmental groups to point out short-term and long-term damage to the quality of life, the environment and ultimately the region’s economy from pursuit of profits through unrestrained development and environmentally irresponsible luxury plane travel. While Mr. Smith spoke about noise mitigation measures and pointed out that air traffic to Truckee is projected to grow, no one in the audience asked any questions about environmental impact and quality of life costs to the community. Marily Mora, President/CEO of the Reno-Tahoe Airport Authority, who also spoke at the event, pointed out that the Reno airport, which operates without any local tax subsidy, is seeking to expand tourist travel to the region. 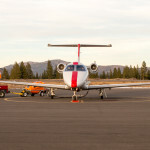 The $4.3 million annual local property tax subsidy to the Truckee Airport should be used by the Board of Directors on more aviation-related actions to minimize the negative impact on the quality of life of the District’s residents and to mitigate the damage that Surf Air, which flies turboprops, and other semi-commercial luxury air travel companies, which use private jets, cause to the local environment. Truckee’s future is in ecotourism, not in unrestrained development and unrestrained private jet travel by a few rich individuals. The one-percenters have many other more environment friendly travel options open to them. 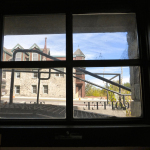 They can contribute to the local economy without undermining its only basis for benefitting current local residents and any future residents and visitors — a clean, quiet and pristine environment. Solution: Ask Surf Air owners and the company’s affluent passengers, and especially the Truckee Tahoe Airport District Board of Directors, to be good neighbors. They should work together on encouraging all semi-commercial luxury air travel companies and private jet owners and passengers to use the commercial airport in nearby urban Reno if they absolutely cannot find any other, more eco-friendly, way to travel. Ask them to spare the fragile Truckee Tahoe area their noise and carbon footprint. If they live here, either permanently or as second-home owners and occasional visitors, they will also be doing themselves a big favor. Truckee residents and residents of other parts of the Truckee Tahoe Airport District can contact the Truckee Tahoe Airport District Board of Directors CLICK to express their views. They can also report plane/jet noise to the airport, either online CLICK, or by calling (530) 587-4119 or 1-800-FLY-2TRK. 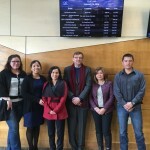 Local residents can also attend the Truckee Tahoe Airport District Board of Directors monthly meetings and raise plane noise and other quality of life and environmental concerns, as well as comment on how their tax money should be used. Maybe it’s because your point is utterly ridiculous. How many flights go in there per day? 5? 10, tops? And you’re bashing Surf Air, who files tiny single engine prop planes? This is really disrupting your quality of life? Or THE ENVIRONMENT? Meanwhile, there’s cars and tractor trailers whizzing by the entrance to the airport 24/7 spewing exhaust. And maybe you didn’t notice I-80 rolls right through there. What a joke. Reno is not convenient for anyone other than those who live in Reno. From the lake, it’s a nightmare getting there over Mt Rose, particularly if you end up behind a truck, or if there’s snow, or if there’s construction. In other words, always. 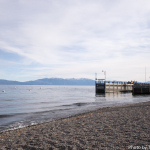 We all need the Tahoe economy to improve. Maybe you didn’t notice the local businesses being crushed by the drought. The economy needs to diversify, NOW. We need businesses in the area providing jobs to the residents, not more ridiculous regulation. I’m thankful everyday Surf Air flies here. You should be too. Steve, you are absolutely right to point out that “no one in the audience asked any questions about environmental impact and quality of life costs to the community.” Thank you for your contribution to the debate. In addition to bashing the article, which was about much more than Surf Air and did not bash it all (Surf Air made news with its new Truckee route announcement, and the article made clear that private jets are even a bigger problem and the main issue is the overall growth in noisy plane traffic in a pristine mountain area and residential community), you raise valid points about development and job creation. The rich visitors to the area can take cars and buses from the Reno airport to their multi-million dollar weekend mansions just like 99% of the common folks do when they fly to Reno because they can’t afford to fly to Truckee and may not want to anyway. What the article talks about is depleting a common resource — the environment. What may appear rational and desirable to you may not be in the best long-term interest of the community. The tragedy of the commons is compounded when no one talks about environmental costs of development. This article does. That’s the beauty of the 1st Amendment. People can read the article, read your comment, and form their own opinion. The tragedy of the commons is a term, originally used by Garrett Hardin, to denote a situation where individuals acting independently and rationally according to each’s self-interest behave contrary to the best interests of the whole group by depleting some common resource. As far as Surf Air is concerned, it is great for the Truckee business people that use it. 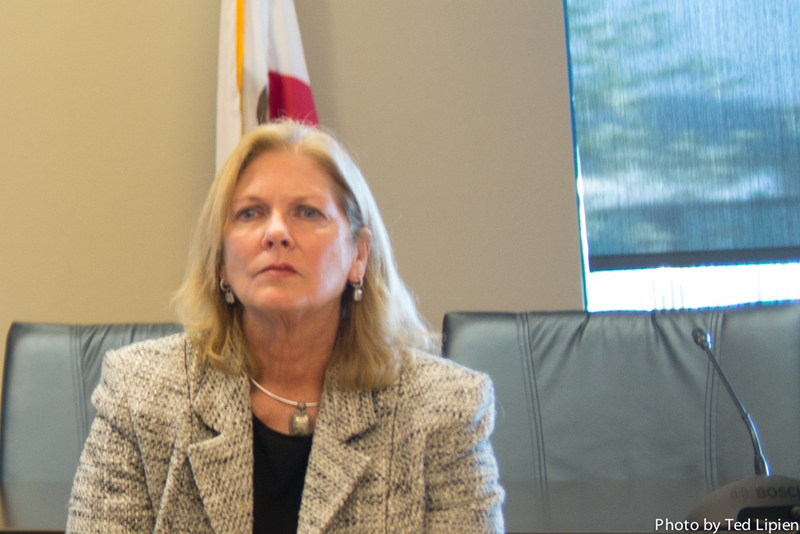 It ensures that they can live here and do business in the Bay Area and vice versa. The planes have 8 seats which is potentially 8 less vehicles on the road. I know contractors, veterinarians, real estate agents, and even a public school teacher that uses the service. It allows families to stay connected even with busy work schedules. As for the new service they are starting, it will be an additional 2 flights, 1 on Saturdays and 1 on Sundays. They are also discontinuing 2 flights a week. This article also seemed concerned with people’s house prices falling which is ridiculous as it is these kind of business folks that keep our economy growing. As far as how much the average member makes, who cares? No I can’t afford to use them but I also can’t afford to get massages or buy expensive clothes. I certainly don’t want to run those local businesses out of town. The airport has been a part of the Truckee community since 1958. Why do you want to run them out of town now? This article didnt offer any logical solutions for handling the transportation needs of folks traveling in and out of the area. Also this was this first time I have heard that “the future of Truckee is in ecotourism.” All of us who live here are concerned with the environment because we are lovers of nature and beauty. It is why we chose to live here. Janice, thank you for your comment. The article made a larger point and offered solutions for the long-term protection of the environment and quality of life from the damage of growing jet and turboprop plane traffic over Truckee’s neighborhood, forests and lakes. Surf Air is only a small element of the growing problem. The environment can only take so much abuse. The solution was for Surf Air and its passengers to fly to Reno instead, but it was also meant for all private jets and their passengers. Reno has a commercial and a general aviation airport in an urban setting. The vast majority of people use that airport. The vast majority of Truckee residents cannot use the Truckee airport because they can’t afford this kind of luxury air service, but they are asked to subsidize it with their property tax dollars. We are suggesting that Surf Air and its passengers be better neighbors and think about their noise impact on their neighbors. You would not want loud motorcycles driving near your house many times a day if you and 98 percent of people living in your neighborhood do not use motorcycles and have no need for them. Would you be OK with giving these motorcycle owners a subsidy from your property taxes so more of them can zip by your house? 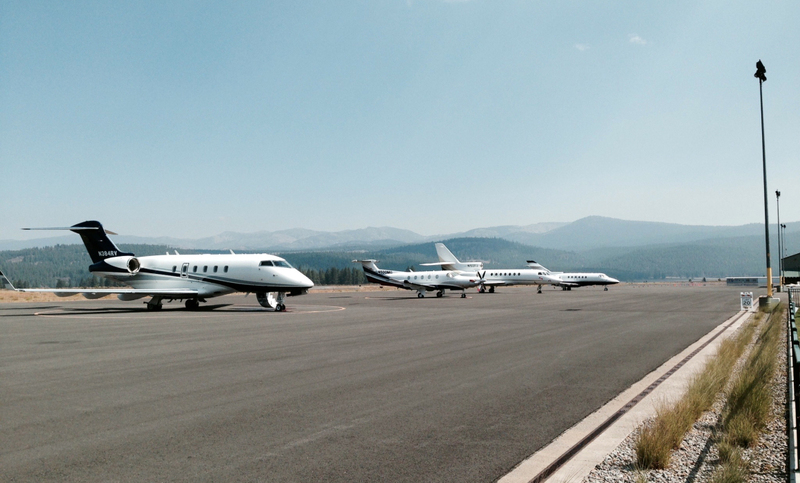 About 99 percent of Truckee residents have no need for private jets because they can’t afford them. That’s the difference between private air travel and car travel and the difference between I-80 and/or trains and the Truckee airport. As for dropping home values, various studies point to home values dropping due to plane noise near airports. See Study: The Impact of Airport Noise on Residential Real Estate. The tragedy of the commons is a term, originally used by Garrett Hardin, to denote a situation where individuals acting independently and rationally according to each’s self-interest behave contrary to the best interests of the whole group by depleting some common resource. In this case it is the quiet and pristine environment. The more private jet and Surf Air flights there are to Truckee, the more unpleasant it will become for people who live here who do not crease noise and air pollution of this kind for their neighbors but have to live with noise and pollution created by a small group of affluent individuals who are unwilling to give up their own convenience for a greater good. At some point, key traffic over Truckee will drive tourists away. These costs to the community need to be evaluated and considered. That was the main point of the article. It was not only about Surf Air which simply provided a news peg to start a discussion.